Hi! 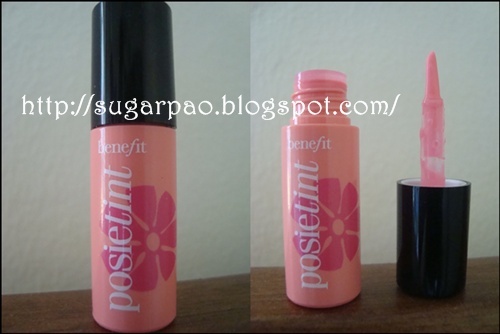 I promised Ariel that I'd do a product review of Benefit's Posietint so here's my two cents on the product. I would like to point out that the opinion given below are mine and mine alone. ;) And, I'm rather new to blogging and doing reviews so I might not be as good as some bloggers are, but I will try to cover as much as I can. Also, as I previously mentioned, I bought Posietint with my own money. Posietint comes out as creamy sheer pink - I applied and blended it with my fingers. At first I thought I should build it up some more since it looked pale with just one application. Please note that this products dries up rather quickly so blend away or you'll have a weird pink stripe or spot on your face. After about 30 minutes or so, I noticed that my cheeks and lips got pinker than during initial application so I blended it again because it was just a bit too much. LOL! So I guess the technique is to apply 1 or 2 coats depending on your preference but please remember that the rosy pink color will appear more vivid after a few minutes so try to not put on too much. "A little goes a long way." On the lips - Well, I tried applying it on its own without gloss. It gives a very natural hint of pink on the lips that I do like but, does not condition nor provide any moisture. :( I have super dry lips.. And without any lipgloss it just looked weird although I loved the color it gave. So yeah, if you have dry lips remember to top it off with a gloss or apply a lip balm and blot it before putting on Posietint. I wore it for 6 hours till I went home and I took it off. The cheeks stayed pretty much the same color but the color on my lips sort of faded away. I would also have to point out that I ate, drank, smoked and well... I just did and that so I don't know if any lipgloss or color would withstand something like that except for the ones that really stain the lips. Posietint also kind of stains the lips, butnot as much as other lipsticks or staining products. I tried swatching it. The first two photos are swatches and the one on the right is what it looks after blending. Uhhh... I don't think the camera is giving it much justice but IRL it looks like a natural sheer pink flush. Verdict - Yeah, it's pretty much worth it. Especially if you're going for a natural look, and don't mind investing on makeup. Benetint was just a bit too much for me. That's the reason why I opted to purchase sample sized ones this time. Smashbox's O-glow fades away on my oily skin and I usually have to put a lot if I t apply it on top of foundation. Posietint seems to compliment my complexion and it does show up even with just a few swipes. Ms. Wedgie - I used to hate pink stuff and makeup but since it compliments my skin it has really grown on me.